Reputation: He wants a lot of power and he wants to look very religious. Recep Tayyip Erdoğan is making a lot of enemies. He first became important in 2002 when his Justice and Development Party (AKP) won a majority in parliament and he became Prime Minister. The party is based in the Turkish tradition of political Islam (not Atatürk’s ideas of politics not being related to religion). He was mayor of Istanbul for a short time, and people knew he liked to change some things eg. traffic and pollution. People hoped he would bring a more tolerant and democratic political Islam. But then they understood that he sees politics as a death match. Here are some of Erdoğan’s enemies now: secular civil society, the Turkish Left, the Kurds, Shi’a Muslims, the young environmentalists of Gezi Park, Armenians and other minority groups in Turkey, and (after the shooting down of a Russian fighter plane by Turkish forces in November) Vladimir Putin of Russia. Putin and Erdoğan seem similar, but they are not friends. Erdogan wants to control Turkish behaviour. There are plans to make adultery a crime and create ‘alcohol-free’ areas. He is old-fashioned and does not like social media: he said he will ban Twitter and arrest teenagers who don’t respect him on Facebook. But he likes luxury. He has a new 1,100-room presidential complex – it cost $615 million. Erdoğan is good at playing games. He says sorry to the young protesters in Gezi Park and then he tells the police to arrest them all. He says he wants to fight the ‘war on terror’. But he secretly supports ISIS. He makes war on the Kurdish Workers’ Party, then makes peace, then says they are terrorists and starts the war again. 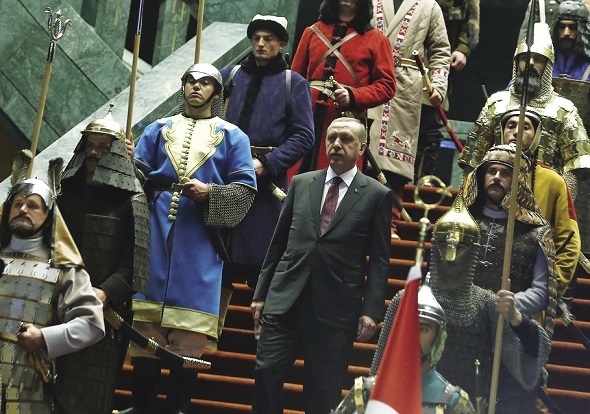 In 2015, Erdoğan greeted important visitors with 16 actors dressed in historical costume to look like old Turkish rulers. Syria is a problem for Erdoğan’s geopolitical ambitions. Syrian President ‘Basher’ Assad (a Shi’a ally of Iran) is in trouble. So Erdoğan started to work with Saudi Arabia’s House of Saud to see if they could both move Syria in the direction of Sunni fundamentalism. They were successful – when ISIS, or Daesh, started. Erdoğan’s government has continued to support ISIS in secret. They allow ISIS to buy their black-market oil and allow arms and new fighters to cross the border with Syria. People who support Daesh in Turkey have said thank you for this by killing hundreds of leftwing people with terrorist bombings. Erdoğan surprised many people when he agreed to be a candidate for president in 2014. He won, but the AKP lost its majority and the pro-democratic HDP party entered parliament for the first time. This stopped him making becoming more powerful. He started a ‘war of tension’ and said this was because of Daesh terrorism. He declared martial law and ended the peace agreement with Kurdish nationalists. So there was less democracy. Journalists and activists were arrested. And the military went to fight the Kurdish regions of the country. Luckily for Erdoğan (but not for Turkey), the ‘state of crisis’ he created allowed the AKP to get a majority again in the 2015 elections. Sources: The Guardian; BBC; Wikipedia; Al Jazeera; Times of India; opendemocracy.net; anonhq.com; rt.com; Middle East Report. NOW READ THE ORIGINAL: http://newint.org/columns/worldbeaters/2016/03/01/turkish-president-erdogan/ (This article has been simplified so the words, text structure and quotes may have been changed). This page was last edited on 18 March 2016, at 19:36. This page has been accessed 1,202 times.